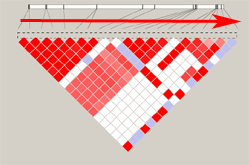 Haploview has extensive support for defining haplotype blocks within a region. It has three built-in block definitions as well as the ability for the user to customize the blocks. In our sample dataset, we can see that the default block definition (Gabriel et al, 2001) breaks our region into 3 blocks: 1-8, 10-14 and 15-16. We can now ask Haploview to try other block definitions or tweak the blocks by hand. Clicking on the marker number will remove it from a block or add it back in if it's bounded on both sides by markers in the same block. 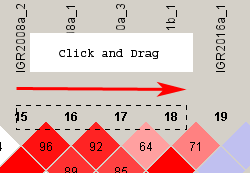 New blocks can be created by clicking and dragging in the area above the LD plot shown at top left. Larger blocks can be made by first zooming out the view and then clicking and dragging (bottom left) or by dragging off the edge of the screen, causing the display to scroll. If you create a block which overlaps with an existing block, the old block is removed. The Analysis menu has options for trying the other predefined block definitions, altering the parameters for those algorithms and clearing all blocks. Full details on the block finding algorithms can be found in the documentation.